Neider & Boucher Attorney Joe Boucher was honored on October 9, 2016, when Edgewood High School hosted its annual Living the Mission awards ceremony. At the event, Boucher and five others received plaques or other awards, and were acknowledged for their achievements and their generous contributions as professionals, philanthropists and volunteers. Joe’s children are alumni of the school, and he has been an active supporter of Edgewood High School both before and after his children’s attendance. Most recently Boucher was inducted into Edgewood High School’s Athletic Hall of Fame. Edgewood’s Athletics Association Hall of Fame honors former athletes, coaches/administrators, and friends of Edgewood Athletics who have contributed significantly to Crusader history by their performance, accomplishments, or contributions of time, talent, and/or treasure. Joe has also chaired the School’s Board of Trustees, for which he was presented the Edgewood High School Alumni Appreciation Award in 2009, and he and his wife support Edgewood’s Theater Department as well. 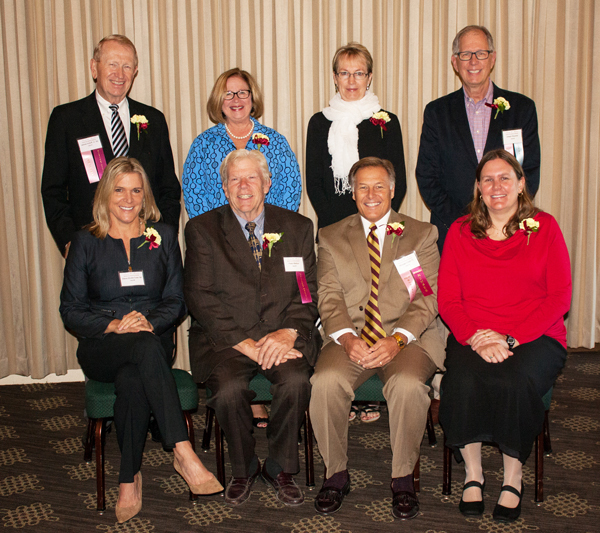 Edgewood honored the recipients of the 2016 Living the Mission Awards and members of the Crusader Court of donors on October 9 at Nakoma Golf Club. Back row: Jim Imhoff, Jr. ’62 (Servant Heart Award), Mary Klein (Alumni Appreciation Award), Cathy Shaughnessy (25 Years Teaching), Joe Boucher (Athletic Hall of Fame); Front row: Diana Shulla-Cose ’84 (Dominican Award for Service to Humanity), Franz Backus (Fine Arts Hall of Fame), Mike Elliott (President) and Mekel Wiederholt Meier ’93 (Mazzuchelli Award for Service to Christian Education). Not pictured: Craig Claussen and Maureen Moravchik (25 Years Teaching) and Carol Markos (Alumni Appreciation Award).